A police van is seen outside the Ecuadorian embassy after WikiLeaks founder Julian Assange was arrested by British police in London, Britain, Apr. 11, 2019. British officials say the United States submited a formal extradition request for Julian Assange, who was arrested in London by British police after officers were invited into the embassy of Ecuador to detain the WikiLeaks founder. Assange, who took refuge in the embassy in 2012 while on bail in Britain over sexual assault allegations against him in Sweden, had become an increasingly unwelcome guest. Last month, Assange's internet access was cut off and he was forbidden from receiving visitors. London Metropolitan police said they had a duty to execute a warrant for his breach of bail conditions more than seven years ago, and they were “invited into the embassy by the ambassador, following the Ecuadorian government’s withdrawal of asylum.” A police statement said he was "further arrested on behalf of the United States authorities." The 47-year-old Assange, sporting a unkempt white beard, waving a finger and shouting, was seen being carried out of the embassy by seven plain-clothes police officers and hauled into a police van. Assange fled to the Ecuadorian Embassy while he was on bail as his lawyers mounted a legal action aimed at preventing him from being extradited to Sweden to face sexual assault allegations. He claimed if deported to Sweden, the United States would seek his extradition to face charges relating to WikiLeaks’s publication of hundreds of thousands of U.S. diplomatic cables and other classified documents. U.S. State and Justice Department officials have never officially confirmed Assange has been charged with any offenses. But in November a clerical error in the court filing of a document in a case unrelated to his suggested criminal charges may have have been prepared. Legal analysts said the error was likely caused by prosecutors copying and pasting from sealed documents. Rumors of Ecuador’s likely withdrawal of asylum circulated last week. WikiLeaks claimed a senior source in Ecuador's state department had warned the hacking organization Assange would be evicted from the embassy. 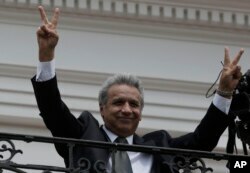 Ecuador's minister of foreign affairs Jose Valencia denied the claim. Behind the scenes, British, U.S. and Ecuadorian diplomats have been in negotiations. Britain and Ecuador sought assurances from Washington that if Assange stands trial in the United States he won’t face the death penalty, says an official privy to the discussions. Following Assange's arrest, Britain’s Europe minister Alan Duncan said, “It is absolutely right that Assange will face justice” Duncan acknowledged there had been “extensive dialogue" about Assange’s fate leading up to the arrest. FILE - Ecuador's President Lenin Moreno flashes victory hands as he greets supporters from the Government Palace's balcony during the weekly Changing of the Guard, in Quito, Ecuador, Feb. 5, 2018. The Ecuadorian leader had been deeply offended, say his aides, by WikiLeaks posting leaked Vatican documents. Key people in WikiLeaks visited Assange before and after the posting of the Vatican documents, Moreno complained. Last October, Ecuador’s leader ordered Assange to refrain from making “political statements” that jeopardized Ecuador's relations with other countries. Assange then sued in the Ecuadorian courts for a breach of his human rights, but his legal action failed. In December, he was required pay for his food, medical care, and laundry. Assange arrest will likely trigger weeks and possibly months of court action, if the United States pursues his extradition. Two years ago Sweden rescinded its arrest warrant, but Swedish prosecutors have said that the case remained open.